Already, I’m starting to feel a little meated out. I mean, the burger competition and then a Wagyu beef cook-out? I can use a little reprieve and hope the menu tonight helps me out. At the bar, Parducci Winery (from Mendocino county) is pouring a 2010 Zinfandel that’s spicy and velvety, plus a 2012 Sauvignon Blanc that drinks smooth and not too sweet. We grab a seat to relax. While more guests arrive, a waitress approaches. “Would you like to try some whisky smoked steelhead?” Juliet turns her nose up; she doesn’t dig smoked fish, but I’m curious. A goodly portion is balanced atop a thin cracker with microgreens, edible flowers, and a tiny cornichon as accoutrement. I pop it in. The smoke is delicate and there is no fishy taste at all. 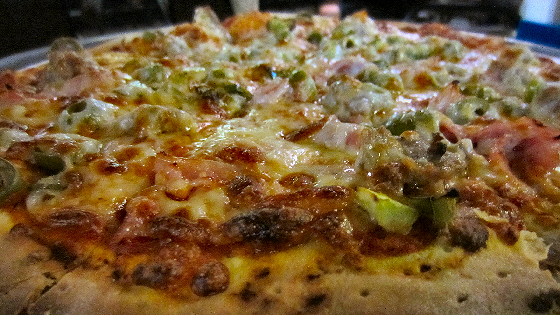 The pickle kicks up the salty tartness. It’s a fun bite and pairs well with the white wine. Soon, another waiter appears with pancetta pheasant meatballs sprinkled with parmesan slivers. I expect the pheasant to be dry. Instead, it’s juicy and salty-sweet, a perfect match with the red wine. I know Chef Adam Sappington can cook, but if this is any indication of the meal to come, I’m stoked! Soon, we are led into Pomp, the Paws Up resort’s upscale restaurant space, where long tables have been set with wine glasses and high quality dinnerware. Juliet and I choose one end of a table, right next to a nice young couple who are enjoying their vacation weekend. The winemaker and chef say a few words, then we’re off to the races! First course is Dungeness Crab Salad with English peas (sorry, Juliet), torn mint, shaved radish, more edible flowers, and a creamy Meyer lemon vinaigrette. On top is a pie-shaped wedge of texas toast dolloped with avocado mousse. The crab is sugary and succulent, soft in contrast to the crisp peas and airy toast. The 2011 Chardonnay, blended in small lots, contains just enough buttery oak to offset the lemon. I can’t imagine a better preparation for crab, and I’m not exactly a shellfish devotee. As I finish, I’m smiling contentedly. Second course is a Crispy Quinoa and Farro Cake topped with tomato-sage preserves, squatting on a bed of creamed Swiss chard while a roasted cauliflower floret leans nearby. It’s almost as if Sappington had read my mind! I’m impressed by the thoughtful planning of the menu, with no beef in sight. I dig into the quinoa/farro cake, so full of flavor and texture, I don’t miss the meat. And the tomato-sage preserves are sheer magic. Chef definitely has a way with tomatoes. Even the chard (which I ordinarily avoid) adds just the right amount of buttery conveyance. A 2009 True Grit Reserve Petite Syrah washes it all down like the best dream I ever had. Alas, all good dreams must end and so we are presented with the entree of Roasted Porchetta on a ragout of wild mushroom, spring onion, and fava beans. It looks lovely, but turns out dry and somewhat mealy. The jus adds too much earthiness so everything is one note. The 2010 True Grit Reserve Cabernet Sauvignon tries mightily to enhance the taste. No go. I leave a goodly portion of the pork left on the plate. Dessert is a Chococolate Whoopee Pie with honey hot fudge. While I appreciate the sense of fun, it’s a little too much like a Hostess Ho-Ho or King Ding Dong snack with powdered sugar sprinkled on top. It doesn’t excite me. The pork and pie undo some of the good will engendered by the appetizers and first courses. Still, I have enormous respect for the chef and feel he worked hard to showcase the wine. Upon arrival we are motioned towards a long line of filled wine glasses on the bar; our choices are Parducci’s 2010 Zinfandel or a 2012 Sauvignon Blanc. After this afternoon’s bourbon adventure, I vow to tread lightly and begin with the white. We settle in some comfy chairs and people watch while sipping our wine. Mine’s a bit warmer than I’d like, and I’m getting overtones of sweet honeydew, pineapple, and lemons. Servers are circulating with two hors d'oeuvres. Not being a huge fan of smoked fish, I pass on the bourbon smoked steelhead though it’s lovely perched on a rice cracker. The pancetta and pheasant meatballs are another story and I gobble one up. It’s rich and juicy, whetting my appetite. Though I never thought I’d be hungry after all our good eats today, my stomach rumbles a bit. The passed tidbits keep circulating and when a server refills our wines, mine is much colder, tasting crisper and significantly less sugary. We mosey to the deck to take in the spectacular view of snowcapped mountains and enjoy the crisp, woodsy air. Soon enough, we are called to dinner with a triangle...so quaint! The dining room is quite large and we choose two seats across from each other instead of side by side at a long table, seating 16 or so. Later in the evening we are told to look under our plates for something special. Turns out I’ve won a custom leather wallet handcrafted by an artisan on property. I even get to pick my leather and pattern the next day. This dinner is off to a fabulous start! 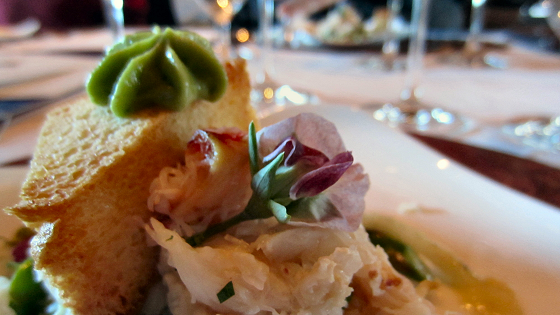 Our first course is a dungeness crab salad with peas, mint, shaved radish, and some avocado crema on a big crouton. The presentation is gorgeous with edible flowers peeking out here and there. A Meyer lemon dressing adds tang to the sweet crab and earthy mint. (As usual, I pick out all the peas. Yuck!) The 2011 Parducci Small Lot Chardonnay reminds me of fall fruit; I’m getting loads of apple up front. The next course is my favorite of the evening, a crispy quinoa and farro cake with creamed Swiss chard and tomato sage preserves. If I could cook vegetarian fare this good at home, I’d never leave the house. I actually consider skipping the next course and trying to scam a second serving of this one. The 2009 True Grit Reserve Petite Syrah is deep and meaty, working with this substantial vegetarian plate. The roasted porchetta with fava beans, spring onion, and mushroom ragout is next. It’s another picture perfect dish, but something’s amiss. The meat is chewy and not flavorful. Many of our tablemates make similar comments and leave a fair amount on their plates. Maybe we got spoiled by the Wagyu beef earlier? The veggies are top-notch and work well with the 2010 True Grit Cabernet. Normally I’d think a wine this deep and layered could only accompany a big beefy dish, but it holds its own with the ragout. Dessert is a chocolate whoopie pie with honey hot fudge. It satisfies any sweet or chocolate craving I will have for a good long time. The honey adds a lusty essence to the hot fudge and the vanilla filling is creamy but light in contrast to the decadent chocolate. I’ve never had a whoopie pie, though now I understand what all the fuss is about. The wine pours (and refills) have been generous. A country band tunes up nearby which is the perfect cue for these two urbanites to call it quits. Dinner was a splendid end to our first full day here!